Learn step-by-step how to use the Spelling and Grammar dialog box in a Microsoft Word 2007 document. To do a complete spelling & grammar check of the whole document, you need to use the Spelling and Grammar dialog box. ► Choose Review Ribbon tab ► Spelling & Grammar button. 1. Place the cursor at the beginning of the document. You can press the CTRL + HOME key-combination to make sure that you are at the beginning of the document. 2. Choose any of the above 2 methods to start the spellchecking. 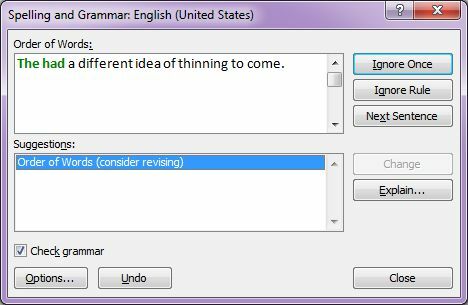 Once, Word finds an incorrect spelling or grammar error, the Spelling and Grammar dialog box will open. The Spelling and Grammar dialog box appears. Spelling errors appear in red type in this dialog box. Grammatical errors are colored in green. 3. Choose any of the following options, depending on what you want to do. This shows the word that is spelled incorrectly in context. You can click the scroll arrows in this box to see preceding or following text. Provides a list of words to use in place of the misspelling. Click the word that you want to replace the misspelled one. Ignores the misspelling, but stops on it again if it appears later in the document. Ignores the misspelling wherever it appears in the document. Not only that, it ignores it in all your other open documents. Adds the word in the "Not in Dictionary" box to the words in the dictionary that Microsoft Word deems correct. Click this button the first time that the Spell Checker stops on your last name to add your last name to the spelling dictionary. Click this button to insert the word in the "Suggestions" box in your document in the place of the misspelled word. The "Delete" button appears where the "Change" button is when the Spell Checker finds two words in a row (the the, for example). Click the Delete button to remove the second repeated word. This changes not only this misspelling to the word in the "Suggestions" box, but also all identical misspellings in the document. This adds the suggested spelling correction to the list of words that are corrected automatically as you type them. Goes back to the last misspelling you corrected and gives you a chance to change your mind. You can click outside the Spelling and Grammar dialog box and fool around in your document. Click the Resume button to start the Spell Checker again. As the Spelling & Grammar dialog box are stopping for spelling errors, it also stops for grammar errors. 4. 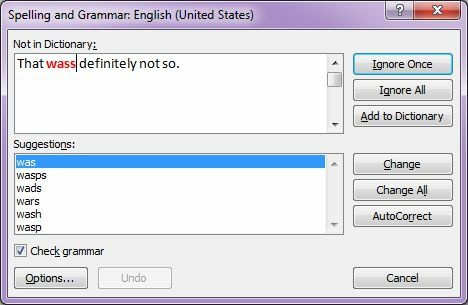 Microsoft Word 2007's Grammar Checker is theoretically able to correct grammatical mistakes in a document. However, a machine can't tell what's good writing and what isn't. Period. Use it with caution. Lists ways to correct the error. Click the correction you want to make. Lets the error stand in your document. If the same error is made again, Word will stop at the grammar error again. Ignore this grammatical error and all other grammatical errors of this type in this document and all open documents. Ignore the error and takes you to the next sentence in the text. Replaces the error with what is in the "Suggestion" box. Word's Help Window pops up with an explanation of the Suggestion given. Reverses your most recent correction. 5. Keep on going with correcting your spelling and grammar, once Word has checked the whole document it will very politely tell you that it has completed the spelling and grammar check.